Somewhere in my archives is a recording of an interview with Basil Rathbone. According to Rathbone's memory, the subject of doing a film featuring Sherlock Holmes came up for discussion at a party. Someone asked, "Why hasn't anyone done Sherlock Holmes?" Well, of course, as we have seen, Sherlock Holmes films had been made right along, from the silent era right into the "talkies." Twentieth Century-Fox Film Corporation ("20th Century Fox") decided to film The Hound of the Baskervilles. They would set it in period, which was a unique concept at the time. Edith Meiser told me that when she approached studios to produce Sherlock Holmes on radio the producers thought Holmes was passe. By now, hard-boiled detectives were the rage, so they suggested changing Holmes into a hard-boiled, modern detective. Ms. Meiser said to them, "You're losing the charm of the man." Fortunately for us, Edith Meiser got her way and Holmes on radio was set in period and maintained his character. Meiser wrote a number of the radio scripts and directed the series in its early days, including those with Basil Rathbone and Nigel Bruce. For the 20th Century Fox version of The Hound of the Baskervilles, Richard Greene got top billing, as he was a better known and more popular actor at the time. Basil Rathbone was often cast as a villain before this. Expert at fencing, he was in some swashbuckling tales -- the classic swordfight between Rathbone and Tyrone Power in 1940's The Mark of Zorro is not to be missed as it demonstrates his great skill. Sherlock Holmes was an expert swordsman, as well, and T. Michael Kaylor, BSI (Baker Street Irregular), has wondered why neither Fox nor, later, Universal studios capitalized on Rathbone's great talent in this regard. 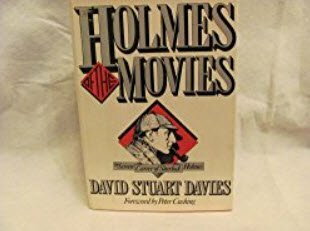 Nevertheless, in Holmes of the Movies David Stuart Davies calls Basil Rathbone "the Ideal Holmes." 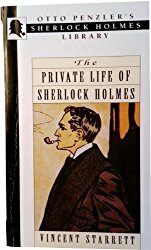 Vincent Starrett modified a statement he made in The Private Life of Sherlock Holmes to replace Arthur Wontner with Basil Rathbone as the 20th-century actor who has succeeded William Gillette. Starrett wrote, "One [Gillette] played him [Holmes] for the nineteenth century, the other [Rathbone] for the twentieth." And Davies writes, "The actor who has come nearest to creating the definitive Sherlock Holmes on screen is Basil Rathbone." Rathbone certainly set a new standard, as actors after him have emulated his interpretation of Holmes. Tom Conway, John Stanley, and others have used Rathbone as a model in their portrayal of the Great Detective. The Hound of the Baskervilles (1939) faithfully followed Doyle's story. Minor embellishments, such as adding a seance as the characters attempt to contact the deceased Sir Charles Baskerville, serve to enhance the supernatural overtones. Other than this one atrocity, the UCLA Film & Television Archive did an absolutely stunning job of restoring the films to pristine condition. They deserve a tip of my deerstalker. We are fortunate, indeed, to be able to view these remarkable and entertaining films today. However, The Adventures of Sherlock Holmes includes a few interesting features. In addition to the exceptional period settings and costumes, Rathbone and Bruce did a credible job at exploring the relationship between Sherlock Holmes and Dr. Watson. Bruce was to distinguish Watson and make him more memorable than did previous actors playing the role. And it was in The Adventures of Sherlock Holmes that we first see a touch of buffoonery on the part of the good Doctor. (In The Hound of the Baskervilles, Bruce played it entirely straight.) I find it interesting that throughout most of the series, including the twelve Universal films, Watson appears as relatively intelligent for the most part. Holmes, in fact, relies on the Doctor's expertise as a medical man. In The Adventures, and in each Universal film, it seems that one brief comic episode is presented which stands out. Somehow, we remember Bruce's comic portrayal in that snippet and Watson is etched in our minds as a comic character. It is true that Doyle himself referred to Dr. Watson as somewhat slow, but we must remember that Dr. Watson was a medical man and, therefore, highly educated. He must have been at least of average or, possibly, above-average intelligence. Holmes did rely on him, after all. It is only as a foil to Holmes's superior intellect and his great skill in observation and deduction that Watson doesn't quite measure up. I was annoyed at this criticism of a work which had been specially designed to please him. "You have erred, perhaps," he observed, taking up a glowing cinder with the tongs and lighting with it the long cherry-wood pipe which was wont to replace his clay when he was in a disputatious rather than a meditative mood- -"you have erred perhaps in attempting to put colour and life into each of your statements instead of confining yourself to the task of placing upon record that severe reasoning from cause to effect which is really the only notable feature about the thing." --"The Adventure of the Copper Beeches"
"Elementary," said he. "It is one of those instances where the reasoner can produce an effect which seems remarkable to his neighbor, because the latter has missed the one little point which is the basis of the deduction. The same may be said, my dear fellow, for the effect of some of these little sketches of yours, which is entirely meretricious, depending as it does upon your retaining in your own hands some factors in the problem which are never imparted to the reader. Now, at present I am in the position of these same readers, for I hold in this hand several threads of one of the strangest cases which ever perplexed a man's brain, and yet I lack the one or two which are needful to complete my theory. But I'll have them, Watson, I'll have them!" His eyes kindled and a slight flush sprang into his thin cheeks. The original Doyle stories show that, in Holmes's arena, Watson is outmatched. However, although Holmes criticizes Watson's literary techniques on more than one occasion, many Sherlockians agree that the two stories penned by Holmes ("The Blanched Soldier" and "The Lion's Mane," which are both included in The Casebook of Sherlock Holmes) are inferior to Watson's literary output. The 2009 film Sherlock Holmes (with Robert Downey, Jr., and Jude Law) gives tribute to 20th Century Fox's movie The Adventures of Sherlock Holmes when Holmes plays the chromatic scale on his violin over and over again in an attempt to discover the note that will annoy the fly. The film also has a raven flying toward the camera in a remarkable, stunning 3D effect (at least on the Imax screens), which is reminiscent of the raven in Universal's Sherlock Holmes Faces Death. After The Adventures of Sherlock Holmes was released, war broke out with Germany. Fox studios believed the public would have little interest in the gaslight era, so in spite of good reception at the box office, Fox discontinued their series. Ultimately, Fox sold the property to Universal studios. Universal updated Holmes and brought him into the modern era to fight the nazis. 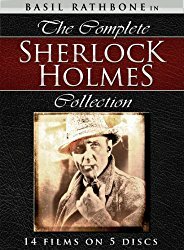 In the first Universal film -- Sherlock Holmes and the Voice of Terror -- Holmes reaches for his deerstalker cap and Inverness cape. Watson says, "No, Holmes. You promised." Holmes replaces his familiar cap and cape, dons a fedora and an overcoat, and Holmes and Watson set out to fight the nazis. Thus begins the first of twelve films by Universal studios -- what David Stuart Davies calls "the Baker Street dozen." "His Last Bow" was Doyle's story that told how Holmes came out of retirement in 1914 to fight the German agent Von Bork, so it is fitting that the Universal series should begin with the end, so to speak. Ironically, the final Universal entry, Dressed to Kill, was based in part on the very first Holmes short story, "A Scandal in Bohemia." At that time, Universal's seven-year contract with Rathbone expired. Universal, as would be expected, wanted to renew the contract to continue this highly successful series, and Nigel Bruce urged Rathbone to accept. But Rathbone stepped down. Publicly, Rathbone implied that it is exciting for an actor to explore a new character, as he had been able to do when first playing Holmes. But after repeating the role for a number of performances, one grows tired of it and wants to move on to explore and develop new characters. Edith Meiser once told me that Rathbone's wife wanted him to step down from the role and he complied with her wishes. Nigel Bruce continued to play Dr. Watson on the weekly radio series and now got top billing; Rathbone was succeeded by Tom Conway in the role of Sherlock Holmes. What I personally love about the Universal series is that we have the entire canon in miniature (and in reverse): From "A Scandal in Bohemia" to "His Last Bow" (or, rather, vice-versa) and the high points of the canon: the death and resurrection of Sherlock Holmes (The Spider Woman), and the confrontation between Holmes and his nemesis Professor Moriarty (The Woman in Green), the Musgrave Ritual and a case that Watson brings to Holmes's attention (Sherlock Holmes Faces Death), politics and crime in high places (Sherlock Holmes in Washington), secret codes and ciphers a la "The Dancing Men" (Sherlock Holmes and the Secret Weapon), the occasional supernatural theme with a rational, logical explanation and conclusion (The Scarlet Claw, which many critics proclaim to be the best of the Universal series), one of the best "murder mystery on a train" films ever made (Terror By Night), a stolen gem with the blood of countless victims in its history (such as "the black pearl of the Borgias" in The Pearl of Death and the "star of Rhodesia" in Terror By Night) and more. We are even treated to Nigel Bruce singing "Flow Gently, Sweet Afton" in Pursuit to Algiers in a bit of extracanonical delight. The script writers of the Universal Holmes series really knew their canon and it is absolute bliss to see how they lifted whole scenes, confrontations, references and quotes from the Sherlock Holmes literary canon and applied them in a creative, original way.